Octopath Traveler definitely reflects its name. With eight characters and their stories available to play through, I was expecting to dive into my chosen character Primrose’s story alone when I began my Octopath journey and was surprised when I noticed all the adventures available on the map, ready to be explored at my leisure. 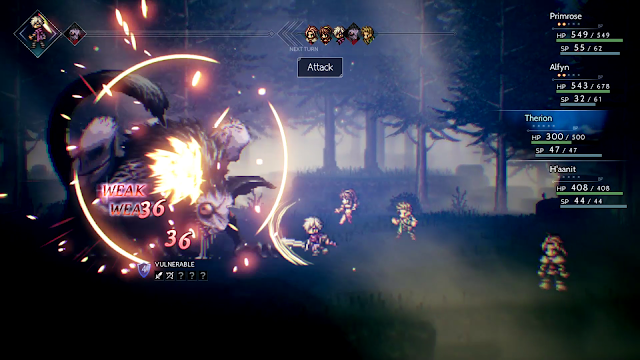 These eight paths are just the beginning of Octopath Traveler’s ability to create freedom in each players Octopath journey, with freedom of party members, secondary jobs, story paths and more making each player traveling through the world of Orsterra have their own unique journey that may be deeper or more challenging than others. 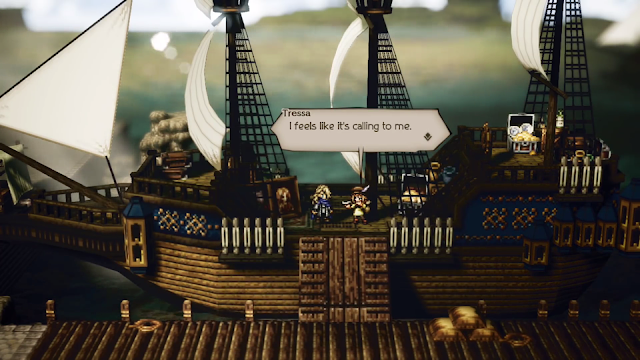 In a world that truly makes you feel like you have many paths to take, Octopath Traveler’s ability to create your own story and game flow make it a unique JRPG that combines the linearity of its individual stories and the freedom of its big world to make each playthrough a true, one-of-a-kind experience. Octopath Traveler’s journey begins with a choice that you may think would affect your overall experience with its story. It prompts you to choose a starting character from its eight, ranging from characters like the stoic Warrior Olberic and the adorable Merchant Tressa, that will affect how your very first chapter plays out. I chose Primrose the Dancer and played through her moving first chapter again like I did in its initial demo. Since I felt like I knew Octopath Traveler well from playing its demo, I was surprised to find that this opening chapter was the only thing my character choice affected for the most part. 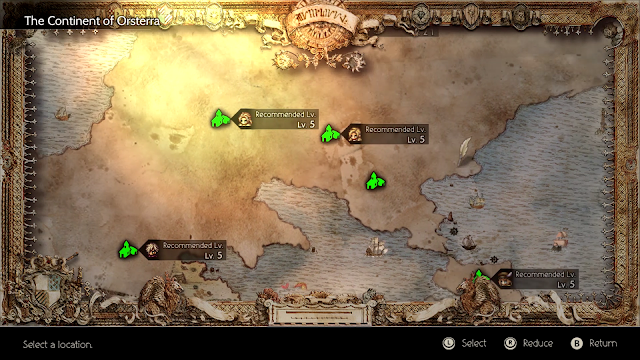 After its first chapter, the map opens up to reveal the seven other character’s chapters all waiting to be played and with my starter Primrose’s second chapter having a level requirement of 21 while I was level 4, the intention of how Octopath Traveler is likely supposed to be played became clearer to me as it encouraged me to seek the other characters out - it is a world of eight stories that are made better by getting to know as many of them as possible rather than going deeper into your chosen protagonist, a choice that sets it apart from other games I’ve tried that offer a choice of a starting character. I had walked into Octopath Traveler ready to mostly explore Primrose’s story, but with levels to raise and the best way to do it being by experiencing the story while gaining party members, I set off on my journey with a new perspective on how I wanted to play. It’s with gaining these levels and experiencing all the other first chapters before experiencing Primrose’s second one that I noticed myself spending less time with her; she was always in my party, but when you meet each character and hear their first chapter, aside from in battle it’s with the chapter’s character alone that you hear their individual story, which was admittedly a little jarring at first as most RPGs I play have each new character interact with each other heavily. It’s one of the choices you have to make in Octopath Traveler - since each character’s story is narratively separate from one another, it’s kind of a choice of whether you want to learn about the world as a whole or learn about one character at a time from a story perspective. For the sake of having a full party, I chose to gather party members but thanks to the different content and personalities in each story making it easy enough to keep up with each narrative being told as a whole, it’s one I don’t regret. It might’ve been jarring at first, but I’ve really come to enjoy this different version of storytelling and the custom journey it provides. At the time of making this, I’ve played through my main party’s first two chapters, have just finished Therion’s second chapter to help make the level grind easier to prepare for the next chapter and will probably play through another character’s second chapter before jumping into the third of one of my party members. This is how I chose to play, but there are other options and paths I could’ve chosen from the start. I could have explored the map and found shrines and caves to help me level up and find new jobs if I wanted to do a more challenging solo journey with a different kind of gameflow, and I still have the option of completing everyone’s second chapter before I do any of the thirds which would be slower, but would probably guarantee I’m strong enough for its third chapters and make chapter two longer. The separate storytelling of Octopath Traveler has essentially allowed me to create my own gameflow - since I love storytelling and exploration more than grinding, I’ve been able to combine the two to make Octopath most fun for me and I can’t think of any other modern games that have given me that kind of choice. Most JRPGs provide choice when it comes to battle or going deeper into the story with endings, but being able to go into the story in the order and way I chose in Octopath Traveler is a new way of playing and experiencing a story that really makes it feel unique. Whether you plan to just play through one character's story from start to finish or experience everything its vast world of choices has to offer, Octopath Traveler is great in the way it doesn’t force you to do either and gives you the freedom to go along as you please. With its only linearity lying in some places being locked before completing certain chapters, whether I want to level grind, experience a story or find a new job to play with, I can do these things at any time and am enjoying deciding how I play based on whatever I need or want to do at the time. As I approach the second half of my party’s chapters, I know my next choice will likely be what order I’ll do chapter three and its final chapter in, how many endings I want to see and which jobs I want to collect along the way and I think that having these decisions are what make Octopath Traveler so fun. So as I continue traveling through its unique world with many different ways to play, I’m excited to see where the rest of my journey will take me. Are you playing Octopath Traveler? If so, how are you playing it?